Dates: 18- 29 JUNE 2018. Think modernism, political strife, street fighting, literature, theatre, and cinema – and think one Indian city. This Summer School is set in, and is about, one of the most emblematic of them all: Calcutta. Returning to the original name before it was changed in 2001, we refer to the colonial port city that was once capital of British India, and the city where, through the twentieth century, some of the most intense debates in history were played out: around colonialism, nationalism, partition, suffering, refugeehood, along side its intense articulation through literature, theatre and cinema. 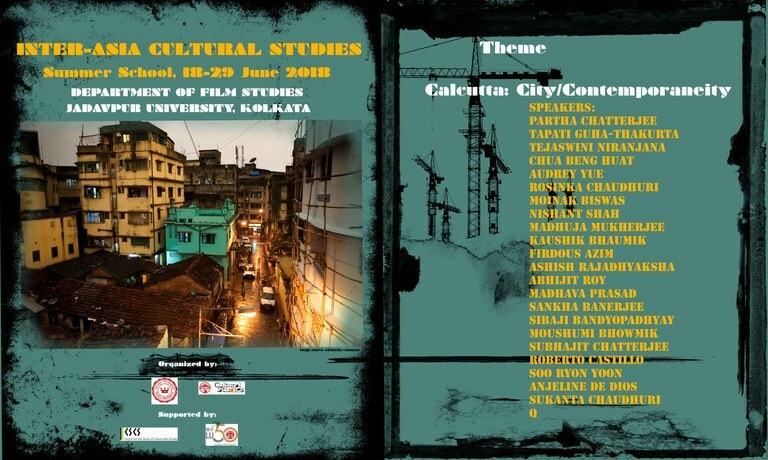 Calcutta: City/Contemporaneity is a two-week multidisciplinary Summer School hosted by the Department of Film Studies, Jadavpur University, which celebrates its 25th Anniversary in 2018. The School uses several converging spaces that make up the moving image across South Asia both physically and metaphorically meaningful. From College Street, the local book publishing area, to famous ‘Tollywood’ movie studios, and from the Kalighat temple, site of one of India’s best known ‘bazaar’ painting traditions, we engage with spaces where modern public life emerged, and morphed into new spaces for making and distributing diverse cultural contents. On the way we will encounter architecture, film, contemporary literary modes, public art, musical forms, television, video and other media, from print through to digital. The course features several contemporary debates that have informed the city’s intellectual traditions as much as they have defined the spaces of their action: its streets and public spaces, its coffee houses, bazaars, and its universities. Lectures on scholarship on the city, its political history, culture, and contemporary media practices, will take place alongside walks in actual spaces showing how Calcutta’s twentieth century unfolded, and where its key present-day struggles lie. While the city’s past and present will be the main focus, our sessions will address the intense Inter-Asia links and will include discussions of comparable Asian locations such as Dhaka, Hong Kong, Shanghai, Seoul, Manila, Taipei and other ports and cities. Summer School Team: Subhajit Chatterjee and Arijeet Mandal. Departmental faculty: Moinak Biswas, Abhijit Roy, Anindya Sengupta, Manas Ghosh, Subhajit Chatterjee, Shradhanjali Tamang, Arijeet Mandal, Madhuja Mukherjee.